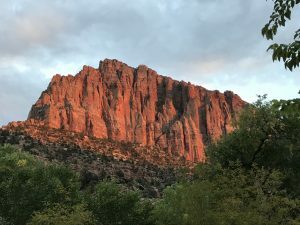 We arrived late in the afternoon on Saturday October 20th with enough daylight to comfortably set up the RV in camp at the Zion Canyon Campground. Our first choice was to camp in the Watchman campground but it was full even when looking last spring. Though we were right across the Virgin river from Watchman, our campground was still a RV campground which while providing convenience with full hook-ups also includes tight quarters with your neighbors. Our preference is for no or more distant neighbors! I did have time to take a walk and sit next to the stream and feel the calming from the sound of the water. Sunset did its thing on the Watchman as captured in this pict from my phone taken next to our RV. A storm was in the forecast for Sunday so our plan was to head out at dawn to who knows where in time to catch the morning sunrise. Our general plan was to spend most of our time on the East side of the park in order to enjoy a little more solitude as well has the fall color that the higher elevations there provided for. We drove out past most of the washes and canyons up to Checkerboard Mesa and pulled off at a turnout with not much time to spare before the sunrise. As the sky was starting to light up and shed warm glow on the surrounding bluffs, I scrambled down from the jeep with my camera anxious for an opportunity to take a photograph. As the earth’s rotation wasn’t slowing and ‘it’ was coming whether I was ready or not, I soon was pulled into a scene that was right in front of me so I stopped and quickly set up for my Checkerboard Mesa Sunrise photo. As I have shared, photography is an art form for me that affords opportunities to be in nature, to slow down and enter a slower place within me in which I can appreciate the beauty that is unfolding. So it is interesting that it is with frequency that I find myself chasing the light instead of waiting for the light. Hmmm, even when I get up before dawn. Anyway I am happy to be putting myself where there are opportunities for what I enjoy. We made it back to the jeep just as the sky let loose with the full fury of the morning storm. After watching the show for a bit we headed back down into town in time to meet up with friends, Mark and Dot, for a nice visit and meal. The sun returned for the afternoon as we returned to the East side for some more exploration. The light was still overhead so we had time to walk about and appreciate that the color of the trees was something special. Opportunities for photographs were not jumping out out me as my vision was overloaded with rocks, color, trees, sand, sky with not much clear separation in patterns and texture. It was beautiful but not simple to convey a scene as chaos and visual confusion reined. I am not used to this visual saturation in my photography being drawn to more expansive scenes. As I walked I thought ok lets filter out some of it and start to look at the smaller things. A few feet later I came on the scene for Simple Beauty, three different colored leaves nestled up against a rock in the slight current that was flowing from the morning’s rain. It was my intention to shoot as much large format as possible and having the time to set up the 4 x 5, this was my first opportunity to do that. (The morning photos were captured digitally with the Fuji GFX 50s as I didn't have the time to use the 4 x 5.) I knew I would need to get in close to compose as I wanted and confirmed this with an app on my phone that I use called View Finder that simulates the different lenses that I have for my camera. The 300mm was what I needed. This meant that the bellows would be stretched pretty close to the limit which brings with it some challenges that I did not have much experience addressing. The further the lens is from the surface of the film the longer it takes the light to get there so you need to compensate with a longer exposure. Fortunately I had the app for that too that would make the calculations for me, Reciprocity Timer. I also use this app to calculate exposure times accounting for latency with some films on longer exposures. The one thing I was missing though was a tape measure to measure the extension of the bellows so I used the one lodged into my brain from being a cabinetmaker for 40 years. My estimate worked. I shot this photo on Velvia 50 and it was probably a stop under exposed but the negative still had good content and I was able to correct for the exposure in post. While there are many, this is one of my favorites from the trip. Another short walk up the wash offered an opportunity for some reflected light bouncing off a west facing wall onto a grove of maples in peak red color. I was drawn to one in particular that had some little yellow flowers blooming in front. Again with 4 x 5 I set up and just as the light was prime a couple descended down from the road above right into my scene to stand in the midst of the glowing red trees to snap iPhone photos. They did eventually notice me and said sorry but continued about with their stomp and trundle in the bushes. After 15 to 20 minutes of this they finally moved off to intrude on a scene Lisa was working on so I thought I had my chance only to have another couple do the same thing! Oh well. They eventually moved on as well after asking me to take their picture in the trees as they pull leaves and branches off the trees to hold up for their photo. ???? After handing their phone back to them I finally had my chance to push the shutter release and expose Spring and Fall on Velvia 50. I must say I was a little rattled by what happened and was questioning whether this was how it was going to be. Word had gotten out about the color on the East side. Were the hordes going to be invading the usual quiet and solitude of these remote areas? Time would tell and if so I was determined to come out earlier and walk further away from the highway to be alone and have unspoiled scenes to photograph. A day that seems like three, filled with riches.